Also known as “The Duck and Duckess of Edinbugh” (unofficial). 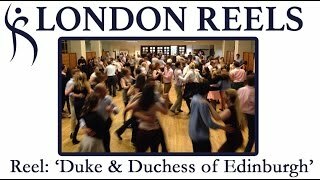 This dance originally came out in 1948, when the current Queen used to be »the Duchess of Edinburgh«. Her husband, Prince Philip, of course still uses the title. The RSCDS officially »blessed« it by including it in Book 39 when it came out in 1996, to celebrate the Queen's 70th birthday. Added on: Sept. 23, 2017, 2:22 p.m.
Wimbledon ~ 180327 Dance 2018-03-27 James Wilson March 26, 2018, 1:58 p.m.
Wimbledon ~ 180605 Dance 2018-06-05 James Wilson June 4, 2018, 11:51 a.m.
Budapest Local Club 11.03.2014 2014-03-11 Zoltán Gräff March 12, 2014, 11:41 a.m.
Wimbledon ~ 161206 Social Dancing 2016-12-06 James Wilson Dec. 6, 2016, 12:26 p.m. 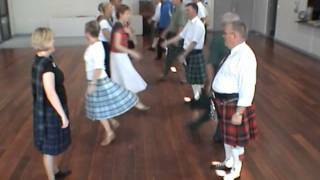 Dancing 11.5.2015 2015-05-11 Keith Paterson May 15, 2015, 9:12 a.m.
Darmstadt_2018_03_05 2018-03-05 OnYourToes Darmstadt March 2, 2018, 6:47 p.m.
Rachel Pusey - Mountain View Experienced 4 2017-01-25 Rachel Pusey Jan. 26, 2017, 5:37 p.m.
Wimbledon 2019_01_29 2019-01-29 Sarah B. Jan. 15, 2019, 3:35 p.m.
170318 Nürnberg WS Technik 2017-03-18 Annette Lotz July 23, 2017, 10:49 a.m.
Morag's programme - 25 April 2017-04-25 Joy Scott April 10, 2017, 10:25 p.m.
wimbledon reels 3.11.15 2015-11-03 Evelyn Norman Oct. 31, 2015, 3:33 p.m.
Wimbledon ~ 150922 Social Dancing 2015-09-22 James Wilson Sept. 19, 2015, 10:51 p.m.
Wimbledon ~ 181002 Dance 2018-10-02 James Wilson Oct. 2, 2018, 6:15 p.m.
Wimbledon 2017_09_19 Sarah B. Sept. 11, 2017, 12:55 p.m.
Darmstadt_2015_06_22 2015-06-22 OnYourToes Darmstadt June 24, 2015, 1:03 a.m.
Wimbledon ~ 150820 Social Dancing 2015-08-20 James Wilson Aug. 19, 2015, 1:20 a.m.
Wimbledon Reels Grand Hogmanay Dance Party 2018-12-31 Joan Blake Dec. 28, 2018, 4:48 p.m.
Reference 2 2019-05-25 Joanne Lawrence Jan. 27, 2019, 11:13 p.m.
Fleet 2014-03-15 Annual Dance 2014-03-15 David McQuillan Feb. 10, 2014, 10:29 p.m.
Oldenburg 2018-02-14 2018-02-14 Martin McWilliam Feb. 17, 2018, 7:55 p.m.
Oldenburg 2018-02-05 2018-02-05 Martin McWilliam Feb. 4, 2018, 7:53 p.m.
ZA 2014-09-20 McGregor Village Ceilidh 2014-09-20 Heather Hodgson Sept. 2, 2014, 12:12 p.m.
Wimbledon ~ 180109 Dance 2018-01-09 James Wilson Jan. 9, 2018, 4:44 p.m.
Wimbledon hogmanay 2017-12-31 Iris Ronayne Dec. 31, 2017, 7:14 p.m.
Wimbledon ~ 150709 Social Dancing 2015-07-09 James Wilson July 8, 2015, 10:47 p.m.
Belleville Spring Social 2018 2018-05-15 Alexander Jeffries May 9, 2018, 4:38 p.m.
Berlin 30th Anniversary Ball 2004 2004-11-06 Cord Walter May 18, 2015, 5:40 p.m.
Wimbledon ~ 170509 Social Dancing 2017-05-09 James Wilson May 8, 2017, 12:48 p.m.
Wimbledon ~ 170425 Social Dancing 2017-04-25 James Wilson April 24, 2017, 10:12 p.m.
Wimbledon ~ 161231 Dance 2016-12-31 James Wilson Dec. 31, 2016, 3:17 p.m.
Trinity 4 May 19 - Colin Dewar 2019-04-04 Bill Austin April 22, 2019, 7:19 p.m.
San Francisco 1964 Scottish Ball 1964-09-04 Andy Peterson Feb. 10, 2019, 12:49 a.m.
Scottish Flowers Hildesheim 2014-02-03 2014-02-03 Cord Walter Feb. 3, 2014, 10:21 p.m.
16-10-15 Eindhoven Ball 2016-10-15 Truus de Ceuster Aug. 26, 2016, 10:56 p.m.
Milan Highland Ball 2019 2019-05-25 Eric Ferguson Feb. 6, 2019, 11:47 a.m.
FSCDC Class 13 February 2018 2018-02-13 Anselm Lingnau Feb. 13, 2018, 10:58 p.m.
RSCDS AGM 2013 Ball (Saturday) Anselm Lingnau Oct. 2, 2013, 9:04 p.m.
Chiswick - 15th October 2017 (orig) 2017-10-15 James Wilson Oct. 17, 2017, 6:24 p.m.
Wimbledon ~ 170817 Social Dancing 2017-08-17 James Wilson Aug. 14, 2017, 7:29 p.m.
Wimbledon ~ 170803 Dance 2017-08-03 James Wilson July 28, 2017, 5:04 p.m.
Wimbledon ~ 170606 Dance 2017-06-06 James Wilson June 2, 2017, 5:48 p.m.
OSCDG - Social Dance October 2018 2018-10-20 Kristian Vestli Oct. 2, 2018, 8:08 p.m.
Scottish Flowers Hildesheim 2014-01-06 2014-01-06 Cord Walter July 10, 2014, 12:11 a.m.
RSCDS Cheshire Branch - Social 31 May 2017 2017-05-31 Andrew Locke March 16, 2017, 6:26 p.m.
Rachel Pusey - San Jose Class 11/28 2016-11-28 Rachel Pusey Nov. 12, 2016, 6:01 a.m.
Caledonian Montevideo 2016 2016-10-01 Nameless Dancer Oct. 17, 2017, 3:16 a.m.
Rhein-Main-Mini-Social, 2. Oktober 2015 (MZ) 2015-10-02 Narhalla Dancers Sept. 28, 2015, 3:47 p.m.
Mountain View - Cupid's Bow Party - 2017 2017-02-08 Rachel Pusey Jan. 29, 2017, 6:42 p.m.
vball17 2017-02-11 Geoffrey Wood Jan. 16, 2017, 4:03 a.m.
RSCDS SF Valentines Ball 2017 2017-02-11 Rachel Pusey Nov. 3, 2016, 3:23 a.m.
New Haven Highland Ball 2019 Brunch 2019-03-03 Deborah Leary Sept. 29, 2018, 2:28 a.m.
Chiswick - 8th October 2017 (orig) 2017-10-08 James Wilson Oct. 9, 2017, 4:25 p.m.
RSCDS BHS 2012-12-27 Christmas Social 2012-12-27 David McQuillan Dec. 6, 2012, 3:51 p.m.
Chiswick ~ 171022 Club Night 2017-10-22 James Wilson Sept. 29, 2017, 7:31 p.m.
FSCDC 7 February 2012 2012-02-07 Anselm Lingnau Feb. 8, 2012, 9:09 p.m.
Valma's Programme - 7 March 2017-03-07 Joy Scott Feb. 14, 2017, 12:05 p.m.
Helensburgh Ball 2017-03-31 John McLean March 26, 2017, 6:20 p.m.
Chiswick Club Night October 2017 2017-10-22 Jerry Reinstein Oct. 4, 2017, 5:06 p.m.
Leeds Branch Dance 18th May 2019 2019-05-18 Janet Brayson March 16, 2019, 1:04 p.m.
2013_08_31_SummerParty_Wimbledon_Reels 2013-08-31 Matthew Goulden Aug. 28, 2013, 3:28 p.m.
Reel club 06/03/17 2017-03-06 Nameless Dancer Feb. 28, 2017, 9:34 a.m.
180317 Maerzenhopfer 2018-03-17 Meinhard Reiser Feb. 2, 2018, 3:21 p.m.
New York RSCDS Jeannie Carmichael Ball 1995 1995-11-04 Andy Peterson Jan. 7, 2018, 2:26 a.m.
Summer Tuesdays 2016_08_02 2016-08-02 Graham Hamilton July 6, 2016, 12:38 p.m.
Duddingston 26 Oct 17 2017-10-26 John Watkins Oct. 20, 2017, 5:45 p.m.
SF Hildesheim 4-Paar-Klassiker 2016-05-09 Cord Walter May 9, 2016, 10:19 p.m.
London ~ 150728 Summer Tuesday 2015-07-28 James Wilson July 22, 2015, 11:19 p.m.
London_summer_Tuesday_28July2015 2015-07-28 Matthew Goulden July 28, 2015, 12:15 p.m.
London ~ 150728 Summer Tuesday 2015-07-28 Jeremy Dent July 22, 2015, 4:49 p.m.
Kirkcaldy Branch Spring Dance 2018 2018-05-11 Bill O'Donnell May 7, 2018, 11:59 a.m. Elementary class Mary Cant March 14, 2019, 11:26 a.m.
Duddingston 12 April 2018 2018-04-12 John Watkins April 7, 2018, 10:26 a.m.
Duddingston 28 March 2019 2019-03-29 John Watkins March 23, 2019, 11:31 p.m.
Royal Caledonian 2016-04-29 Christine Grove March 9, 2016, 8:02 p.m.
Harwell Ball 2016-11-19 2016-11-19 Malcolm Austen April 24, 2016, 2:08 p.m.
Camberley 2012-02-12 social 2012-02-12 David McQuillan Feb. 19, 2013, 1:01 p.m.
Rhein-Main-Mini-Social, 7. September 2015 (DA) 2015-09-07 OnYourToes Darmstadt July 16, 2015, 10:28 a.m.
SummerTuesdays 19Aug 2014 2014-08-19 David Talbot Aug. 19, 2014, 2:28 p.m. The RHN Charity Scottish Summer Ball - SW15 3SW 7pm to midnight 2018-06-22 Matthew Goulden May 16, 2018, 7:27 p.m.
Hamburg Ball 2008-10-04 2008-10-04 Cord Walter May 18, 2015, 12:07 a.m.
Surbiton 28 December 2017 Pre-Hogmanay party 2017-12-28 Nameless Dancer Dec. 23, 2017, 5:23 p.m.
Chiswick - 22 April 2018 (orig) 2018-04-22 James Wilson April 22, 2018, 11:39 p.m.
East Midlands Cyprus Holiday - Day 4 - Thu 16 Feb 2017 2017-02-16 Keith Rose Nov. 12, 2016, 11:26 a.m.
181027 Autumn in Gamundia 2018 2018-10-27 Martina Mueller-Franz Sept. 5, 2018, 1:10 p.m.
Delaware Valley RSCDS Hogmanay - 2010-2011 Andy Peterson April 1, 2018, 5:09 a.m.
Rhein-Main-Mini-Social, 7. Juli 2015 (F) 2015-07-07 Anselm Lingnau June 18, 2015, 1:26 p.m.
2018-3-26 St Columba's Dancers Sarah B. March 22, 2018, 9:16 p.m.
Chiswick - 22 April 2018 (Original) 2018-04-22 Jacmel Dent April 23, 2018, 10:04 p.m.
St Columba's 14th March 2016 Sarah B. Jan. 17, 2016, 6:57 p.m.
Chiswick - 22 April 2018 2018-04-22 Jacmel Dent April 16, 2018, 2:45 p.m.
Wimbledon List 2018-01-27 Simon Stewart Jan. 27, 2018, 4:53 p.m.
20161203 Paris evening dance 2016-12-03 Aliénor Latour Nov. 14, 2016, 12:12 p.m.
Johnsonville SCD NZ Final Night Nov 2017 2017-11-20 John Munro Oct. 25, 2017, 12:42 p.m.
Chiswick - 22 April 2018 2018-04-22 James Wilson April 22, 2018, 11:42 p.m.
2018-03-19 St Columba's Dancers Sarah B. Dec. 27, 2017, 5:36 p.m.
Surbiton 2017 December 28th - Pre-Hogmanay dance with music from Calum Mitchell 2017-12-28 Jenny Kendrick Dec. 23, 2017, 8:06 p.m.
Mary and Bruce - A Wedding Ball - 1990 1990-05-28 Andy Peterson Jan. 7, 2018, 2:38 a.m.
Chiswick - 1st October 2017 (orig) 2017-10-01 James Wilson Oct. 9, 2017, 3:56 p.m.
18th THAN Scottish Summer Ball SW15 3SW 7-midnight 2017-06-23 Matthew Goulden June 21, 2017, 6:27 a.m.
RHN Summer Charity Ball 26th June 2015 London 2015-06-26 Matthew Goulden June 22, 2015, 7:23 p.m.
RSCDS SF - December Party 2015-12-05 Rachel Pusey Nov. 18, 2015, 10:04 p.m.
RHN Scottish Summer Ball danced to Ian Muir and Craigellachie at The Royal Hospital for Neuro-disability, London SW153SW 2016-06-24 Matthew Goulden June 5, 2016, 1:37 p.m.
RSCDS Manchester Branch - Annual Dance 2016-05-21 Helen Freer July 19, 2015, 2:31 p.m.
RSCDS BHS 2017-03-11 Day School Dance 2017-03-11 David McQuillan Jan. 14, 2017, 12:13 p.m.
8.SCD-Weekend Chemnitz Social 2018-11-17 SCD Chemnitz Sept. 16, 2018, 8:45 p.m.
150728 w1 - St Andrews Br. Summer Dance 2015-07-28 Martina Mueller-Franz May 18, 2015, 2:59 p.m.
St Columba's Dancers 190520 Band Night 2019-05-20 Sarah B. April 19, 2019, 6:15 p.m.
Camberley 2013-10-18 Charity Dance 2013-10-18 David McQuillan Oct. 7, 2013, 11:21 p.m.
RSCDS Cheltenham 60th anniversary dance 2018-05-19 Jette Rossen May 16, 2018, 12:02 a.m.
RSCDS Edinburgh Branch Ball 2015 2015-05-09 Andrew Locke April 26, 2015, 8:02 p.m.
Trinity SCDC Edinburgh 2017/12/16 2017-12-16 Daniel Hintermann Dec. 12, 2017, 6:14 p.m.
Willie's Fling Jan 2018 2018-01-06 Brian Anderson Jan. 5, 2018, 10:19 p.m.
Dunfermline Ball Dec2017 2017-12-08 John McLean Sept. 7, 2017, 12:02 p.m.
Dundee Festival 2014 Stella Phillips Oct. 24, 2013, 4:50 p.m.
Trinity SCD Edinburgh 06/05/2017 Colin Dewar 2017-05-06 Daniel Hintermann April 18, 2017, 11:02 a.m.
Christchurch Caledonian Open Night Amy Martin May 9, 2014, 12:02 p.m.
Kirkcaldy Annual Ball 4/3/17 2017-03-04 Jim Armstrong March 1, 2017, 9:50 p.m.
London Branch 85th Anniversary Ball 2015-10-31 Jane Rose Sept. 30, 2015, 3:36 p.m.
LHC President's Night 2/9/17 2017-09-02 alan poh Aug. 30, 2017, 11:26 p.m.
140502 Edinburgh Br. 90th Ann. 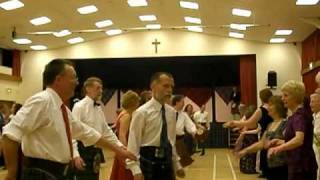 Ball 2014-05-02 Martina Mueller-Franz Dec. 2, 2013, 5:01 p.m.
Kirkcaldy Ball 2017 2017-03-04 John McLean March 1, 2017, 8:31 p.m.
New Scotland Annual Dance 2016 2016-01-30 Nameless Dancer Jan. 30, 2016, 12:53 p.m.
Oxford Christmas Dance 2018 2018-12-28 Christine Jeffery Dec. 12, 2018, 9:37 p.m.
RSCDS Birmingham - Spring Ball 2017 Nicola Scott Dec. 29, 2016, 11:37 p.m.
Berkhamsted Strathspey & Reel Club Spring Dance 2015 2015-05-16 Gerard Elliott March 20, 2015, 2:35 p.m.
London Highland Club - 7 May 2016 2016-04-09 Stuart Kreloff May 3, 2016, 11:01 p.m.
Jacmel Dent · June 7, 2016, 12:13 a.m. This version is incorrectly danced. 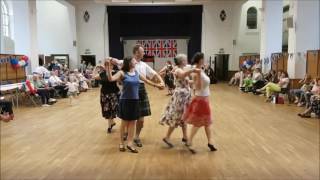 1) After the advance and retire, then two hands round with your partner, the 1st couple should cast off and touch hands between the 2s in the centre of the dance, then cast up from below the 3s, meet in the centre after casting in between the 2s, and cast off at the top of the dance to 2nd place. 2) The 1st couple should turn 1st corner and then PARTNER and not go straight to 2nd corner. For these reasons, I don't consider this is a "good" version, at best it's "Social/Informal" and it is misleading.